Kyle Kaplan wears black and red low top Converse “Chuck Taylor” All Stars in the film. 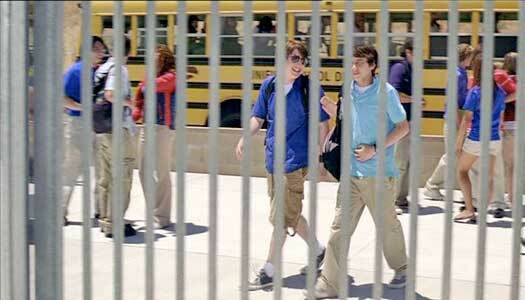 Peck and Geiger arrive at American High School on the first day of class. At first glance, Just Peck seems to be another typical coming of age story with comic touches about a young teenager trying to cope with his lowly social status at school and gain some freedom from the restrictions his parents place on him. Then he meets a girl completely out of his social scene, they somehow connect, and things happen. But this film takes you in some very different directions. As the film opens, we are introduced to Michael Peck (Keir Gilchrist) who prefers to be called by his last name (hence the title). Peck is starting his sophomore year at American High School, located in an affluent suburban community somewhere east of San Diego or Los Angeles. Peck is barely over 100 pounds and doesn’t have a lot of friends or outside interests. His parents are a piece of work; his mother (Marcia Cross) is on the school board and possesses Libertarian views, which seem to reject any outside control or discipline on her son, but personally she has all kinds of behavioral contracts about how Peck is supposed to behave at home and school down to the elective selection chosen for him. His father (Adam Arkin) is some sort of scientist and supports the rather bizarre way that they are bringing up their son. They treat Peck as if he is a business asset, reward him with corporate perks like a coffee mug when they feel he has achieved something positive, and make Peck give them PowerPoint presentations when he wants to make changes in his life style. They even buy all his clothing, apparently without consulting him, and put it neatly folded in his dresser. Luckily Peck does have a best friend Geiger (Kyle Kaplan) who is bigger and stronger, and helps keep the bullies away from Peck. Geiger and Peck see Emily and Becca driving into the shopping center. To add to his nightmarish existence, American High School is run by Ms. Wood (Camryn Manheim), an authoritarian principal who preaches at the students through constant television announcements all over campus. She posts slogans on the activities board at the front of the school like “You don’t learn from success, you learn from failure”, “It is through suffering that learning comes”, and “It’s never too late to be what you might have been.” The academic attitude seems indifferent as a result, with clear class hierarchies among the students, not much interest in learning, and little acceptance for someone with average intellectual or social abilities like Peck. For example, Peck’s elective is band which should be a fun class, but at the first rehearsal, the band director singles out Peck’s trumpet playing as being so bad that he berates him for never practicing and tells him to leave the class. Geiger is in the band also, and decides to leave after Peck is kicked out. The two wander over to the nearby mall to get some food and drinks, when they run into seniors Emily (Brie Larsen) and her friend Becca (Tiya Sircar), who have also cut class. The only reason that the girls pay any attention to the boys is because they were brave enough to say hello to them earlier that day. On a whim, and to the disgust of Becca, Emily invites them to smoke a joint before going back on campus. The next scene is in the office, where the four have managed to be caught by campus security and are assigned to detention. Soon we see the first run (of several) in between Ms. Wood and Peck’s parents. Later, Peck makes a PowerPoint presentation called “Mind and Body” to his parents, requesting that he be allowed to join the wrestling team which has an opening in his weight class. But instead his parents decide he should be in the Science Club, making a project for the annual Science Fair. On campus this is considered to be the height of nerd behavior. Its participants are routinely called “Science Fairies” by much of the student body. Geiger defeats Peck in a wrestling match. Instead of settling into the usual scenario this type of set up would indicate, the film veers off into a story of character development for Peck. He discovers that Emily has some serious emotional issues in her life as he begins to get to know her better. He is surprised that all of her age level friends don’t seem to care about her, unconcerned that she is missing large blocks of school and is escaping into drugs and alcohol. The most shocking thing is that her parents don’t care either; they are totally absent from her life, purposely unaware of her situation and unwilling to acknowledge the problems in her life. The key to Emily and Peck bonding is that he is willing to listen with a sympathetic ear to what she says. As he shyly tells her on one occasion, she is perfect in his eyes. Peck is also determined that his Science Fair project will make a statement, something that will shock the school establishment and make his parents regret forcing him into the Science Club. Using something Emily told him and keeping his plans well hidden from his parents, other students and authorities at school, he develops a T3000 machine that purports to test whether someone is suicidal or not. With Emily as his test subject, everyone is at first fascinated and then shocked by the test and what it reveals, causing Peck to realize the one horrible flaw in his plan for shaking things up. Now it is up to Peck to make things right again before it is too late. Peck must present requests to his parents in formal meetings. Given the story line of the script, Just Peck would probably not get made today, given the controversy of more contemporary stories about suicide like 13 Reasons Why. At its release in 2009, it didn’t receive a lot of attention, perhaps due to the underlying subject matter. Even someone as naive as Peck would understand that in today’s world. Just Peck succeeds mainly due to the fine acting performances of Keir Gilchrist (surprisingly a British actor) and Brie Larson. Gilchrist is especially good at expressing the awkwardness of his character, and how he slowly starts to “get it” as the film progresses. And once he does, his character becomes all the better for it. You soon realize that he does occasionally have important things to say and that he is not afraid to say them. Brie Larson gives a very nuanced performance as the audience begins to understand the tragedies in her life. Her character expresses the important life lesson that money and status don’t mean much when there is no family support in your life. Luckily that part of the story is handled in a lighter, family-friendly way that promotes discussion rather than discourages it. It’s an interesting screenplay by Marc Arneson but there are some flaws in the depiction of the high school and its staff, the biggest being on how a science fair is run. With so many of the students expressing a negative view about the Fair and the student participants, why would you show the untested projects in an all school assembly when their demonstration would be better handled in a typical Science Fair exhibit area, where everyone could examine the projects at their leisure and the student entrants would have time to set up and test their entries? Also in a normal school the student government would be involved in the daily announcements, and no trained band teacher would berate a single student at the first rehearsal when a few quick instructional steps would lead to an improved sound for the entire ensemble. But the eccentric adults and plot set up are what leads to the interesting character development later in the film, so it’s okay to just laugh at the absurdities and look the other way. This film also seems more realistic in its depiction of teenaged drug use and language then others in the genre that tend to ignore or hide it. Just Peck is worth a look, especially for a family with older children. It certainly will provide you with a lot of topics for discussion. Despite their differences, Peck and Emily begin to develop a friendship. Geiger and Peck sitting on a wall at the shopping center. Geiger, Peck’s best friend, wears black low top chucks throughout the film and other students on campus are seen wearing chucks. Geiger also is seen wrestling in pale green slip-ons, and in red low cuts as part of a Halloween costume. The best scenes are at a nearby mall after they leave band class and and later when they have a fight on Halloween. Peck and Geiger get into a serious fight. Just Peck (2009) Keir Gilchrist, Kyle Kaplan, Brie Larson, Marcia Cross, Adam Arkin, Camryn Manheim, Tiya Sircar. Directed by Michael A. Nickles. Categories: Comedy, Family, Coming of Age.